Preheat oven to 325 degrees F. Line a roasting pan with heavy-duty foil. 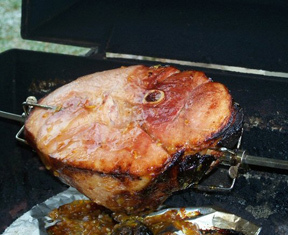 Place ham on a rack in pan. Combine pear nectar and orange juice. Brush 1/3 of the glaze over ham. Bake, uncovered, 30 minutes, brushing twice with remaining juice mixture. 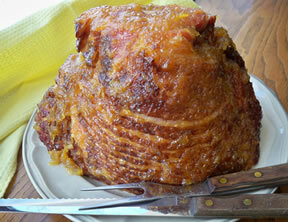 Combine the brown sugar and honey; spread over ham. 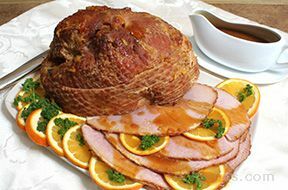 Bake 45-55 minutes longer or until ham is heated through, basting occasionally with pan droppings. 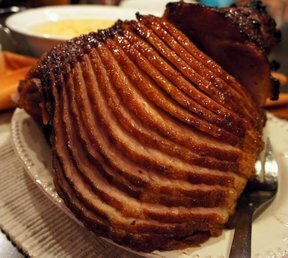 "The crust on the outside of the ham is to die for! I couldn't stop picking at it. I baked up some of those frozen bread rolls. So now I have leftovers for sandwiches for lunch. Yeah!"